Feel the emotion of the new year's eve at Valparaiso. More than 30 Km of fireworks across the coast, from Quintay to Concón, will surely give you good luck for the next year! Valparaíso is a city of Chile, located northwest of Santiago, is one of the country's most important seaports and an increasingly important cultural centre in the Southeast Pacific. The city is the capital of the Valparaíso Province and the Valparaíso Region. Plaza Sotomayor is the main square in the centre of Valparaiso, where visitors will find a giant monument for the local heroes and the beautiful building of The Armada de Chile. Nearby Plaza Sotomayor there are all kinds of shops and also some of the funiculars taking you uphill for a better view of the town. Pablo Neruda House, La Sebastiana, is situated on a steep hill overlooking the city and harbour. The house and the gardens, with spectacular views, are stunning, full of memories, poems, books, a wooden horse and also a bar with marine atmosphere. 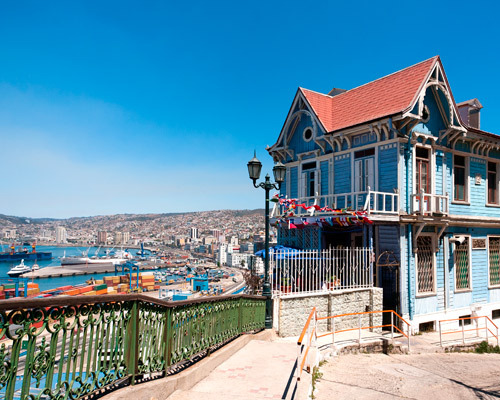 Valparaiso has a remarkable architecture of colourful houses hanging from the cliffs, surrounded by trees and with historical building at the bottom. That's what Valparaiso is. It is a delight to get lost and explore the different hills, each one with its own character and people.Valparaiso is a melting pot of people, poets, bohemians and lovers, which shines throughout the world as the jewel of the Pacific.